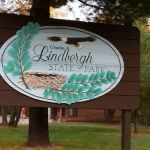 Ask fellow campers about "Charles A. Lindbergh State Park" and nearby attractions. I stayed here for two nights while passing through in a 27 foot motorhome with a tow car. Smaller state park gifted to state by Lindbergh's family after his historic flight -- it was the family farm on the Mississippi River. Lindbergh House and Museum are across the street from the park. Two loops -- a 15 site electric loop and a 22 site primitive loop. Set up is a little weird. The water/dump station is to the right of the electric loop. If you fill up with water you have to circle around the primitive campground or by the bath house and come back down to enter the one way road into the electric loop. The problem is that from that direction the angle into the one way road was too sharp for me to make the turn and I ended up having to drive out of the park (there was no turn around loop at the front of the park) and turning around up near the city and coming back into the park. This wasn't just me -- I watched someone with a pick up and large trailer who ended up doing the same thing. There is no issue if you don't have to fill up with water first or if you have a small camper. Sites themselves are nice -- very wide gravel with dirt and separated from other sites by thick trees -- in fact the whole campground part of the park is in deep forest. There are indeed a LOT of mosquitos. The trails are wonderful -- well maintained (a few boggy areas but nothing impassable), well marked, and mostly through the forest and along the creek -- but again -- bring your insect repellent. I can't imagine the park ever feeling crowded even when full. Very quiet and secluded feeling. Verizon worked well. We camped at Charles A. Lindbergh State Park in a Motorhome. Lindbergh House and Museum well worth the admission but only open Thursday through Sunday. 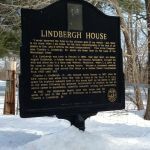 I did a drive thru of Crow Wing and Lindbergh parks to see if I would like to stay. I have a smaller travel trailer and I don't think my TT would fit in any of the sites. Again, this campground was designed for tents, teardrops and pop ups. The sites were somewhat spread out, low on grass and high on mud after rain storm. A bonus is the campground is small, so less noise. In the city of Little Falls, so supplies are near. I will likely pass on staying here as other parks are so great. Please check out this campground for yourself as I did an eyeball assessment, which isn't fair. I will continue to watch reviews. We camped at Charles A. Lindbergh State Park in a Travel Trailer. I was there for the fall color. Absolutely awesome. Very few campers, great trails to walk, quiet and peaceful. There are no annoying lights. You can hear distant trains sometimes at night but they're far enough away to be cool. A river runs behind the camp sites and bridges on the trails to cross it. Enough conveniences locally to make it fun and interesting. All in all it was a great visit We camped at Charles A. Lindbergh State Park in a Fifth Wheel. We were pleasantly surprised. This is a nice park. We stayed in site 10e. The electrical sites are in one row. There is nice spacing between sites. You don't feel like you are being crowded by your neighbors. The non-electrical sites are in a loop. We noticed a few had raised and level tent pads. There is a small stream next to the campground and the Mississippi River is a short walk past the ranger station by the park entrance. The city of Little Falls is nearby, along with two museums which are close to the park. It's a nice park to spend a weekend with the family. We will come back. The only negative was the water wasn't turned on yet for the flush toilets / showers. We camped at Charles A. Lindbergh State Park in a Motorhome. Are you affiliated with Charles A. Lindbergh State Park ?